We invite you to contact us today to discuss your care. Please don't hesitate to call us at (813) 835-7550. 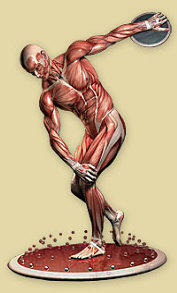 Book your massage therapy appointment with our Massage Therapist today! Welcome to a place where we always stand behind you, literally. 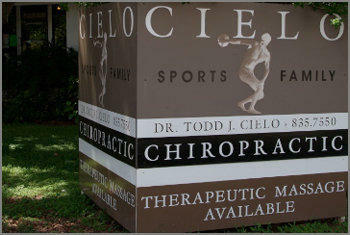 Dr. Todd J. Cielo and his friendly staff at Cielo Sports & Family Chiropractic Centre have been supporting hundreds of residents in the South Tampa community with a special emphasis on hands-on care. In addition to offering this tested and proven foundation for healing, we provide our patients and their families with our “Cielo Wellness Program.” The key to perfecting your health lies in prevention. That’s why we make it possible for you and every member of your family to visit us regularly for adjustments, specific stretching and strengthening programs, body maintenance and more – all for a small monthly fee. So, please feel free to call us at (813) 835-7550 and we will set you up with an initial visit/consultation which will start you on your path of Chiropractic wellness. Dr. Todd Cielo is by far, the best DC I’ve ever known! My wife had two compression fractures in her spine, and after surgery, he was her best advocate as far as post surgery recovery! He helped us understand the various test results, and provided guidance before, during, and after surgery! 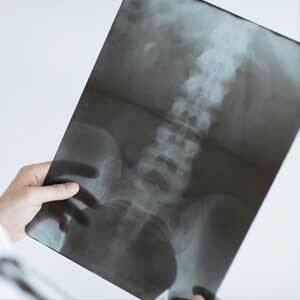 Dr Cielo is very knowledgeable and provides excellent recommendations. He is very intuitive and very efficient. He has a great personality as well. Dr Cielo unlike the many Drs I have seen thus far, took an interest in my back took the proper X-rays. Explained them properly. Took additional steps to tell me "no on heating pads" that I need "ICE" that helped a bunch. I think he is the last Dr in Tampa that cares!!! He will always be my Dr!!!! I love Dr Cielo, he always treats me aggressively...which I need. He gets me, " out of the woods"